Interviews with Diana Giese highlight the strength and resilience of Khmer Australians. They tell of their experiences from 1975-79 under the murderous Khmer Rouge regime in Cambodia, when families were broken up, education and employment ruined, homes destroyed and land stolen. They speak of their experiences in Thai camps, their journeys to Australia, and the way they have built lives and community in this country. They describe their relationships with Cambodia now, and with their 2000-year-old cultural traditions. 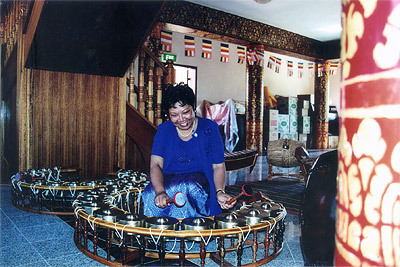 Nairand Kay with traditional musical instruments at the Bonnyrigg Temple, during a Travel at Home tour. 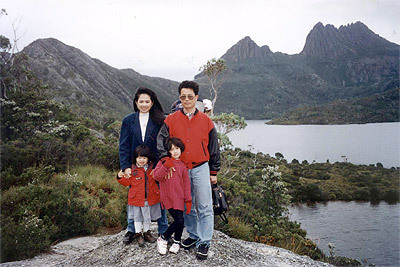 Nairand was the President of the Khmer Community in New South Wales. She works with Centrelink, the national welfare agency, advising people from many different backgrounds. She is married to an Australian inventor, Roger. After arriving in Australia in 1983 with her mother, sister and brother, she very quickly started to remake her life. She was determined to apply for any available work. Nairand goes on to speak about a theme that resonates through this whole group of tapes: relationships between those who came from Cambodia as adults, and those who were born and brought up in Australia. Dany Touch (second from left), photographed with her ministerial award for success in learning Khmer language. 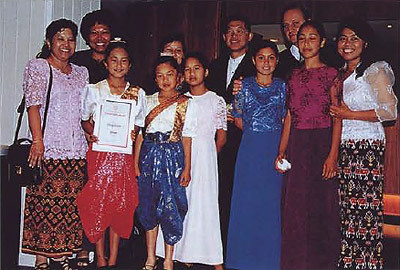 Nairand Kay, President, Khmer Community (back row, second from left), and Sorathy Pouk Michell, Head Teacher of the Khmer Language Sunday School, with Michael and their daughters (right). Sorathy Pouk Michell’s and Michael Michell’s marriage is an interesting exploration of cross-cultural relationships. Sorathy and Michael both work in language education, and have been involved in the introduction of Khmer language programs into the mainstream system. Sorathy is Head Teacher of the Khmer Language Sunday School and Michael works at the University of New South Wales. Sorathy describes the events that followed Michael’s proposal of marriage. Read Sorathy Pouk Michell’s story, 'How to survive' as retold by Diana Giese in Conversations 6 (2), Summer 2006, Pandanus Books, Research School of Pacific and Asian Studies, Australian National University. 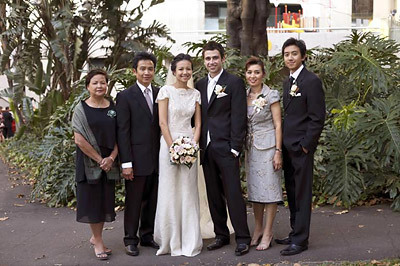 Andrew Chong-Hean Ang (second from left) at the wedding of his daughter Helene and son-in-law Dave, with his sister (far left), his wife Momm and son David. Andrew Chong-Hean Ang was from 1993 Centre Manager at Burnside Cabramatta. In Cambodia before Pol Pot, he had almost finished a Law degree. In Australia, he has gained a Master’s in Social Administration and a management qualification from the Australian Graduate School of Management. He now manages TAFE multicultural education services in southwest Sydney. At Burnside he helped provide free multicultural, multidisciplinary programs for family support, child protection and youth. His aim there, he said was 'to empower people to take charge of their own lives'. But first, he and his co-workers helped overcome some major difficulties. Some refugees find nightmares and depression lingering as a legacy of torture and trauma, and struggle with the challenges of a new culture. Soour Hai Gov arrived in Australia as an orphan. 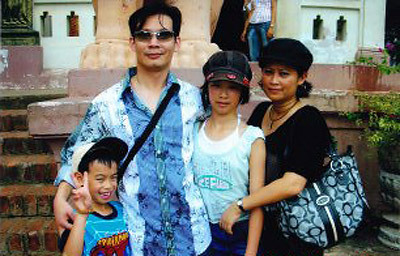 He has now gained a Science degree and, with his Vietnamese wife, started a business. He works for Housing NSW, where he has received high praise for his dedication to, and compassion for needy clients. In his early days here, he harnessed his energy to work with young refugees experiencing some of the murderous anger he used to feel himself. He became a team leader for the Youth Service at Burnside Cabramatta, putting his emotion to constructive use. He had been prey to strongly negative feelings. Soour Hai Gov and his family. Ramy Var, her husband Long and their daughters Vanessa and Malinda, on holiday in Tasmania. Ramy Var arrived in Australia in 1983 with her younger sister. After early jobs in refugee and migrant health services, she now leads teams at the Sydney West Area Health Service facilitating transcultural mental health. On the tapes, she talks about her work in identifying commonalities in refugee experiences: war, torture, family members murdered, starved, 'disappeared'. Links Access full interviews through the National Library’s Website at http://catalogue.nla.gov.au/Record/285250See articles in National Library of Australia News http://www.nla.gov.au/pub/nlanews/previous.html for Diana Giese’s articles ‘Cultural Reconstruction in Cambodia and Vietnam’, July 1995; ‘Beyond Survival: Reclaiming Culture’, September 2001. Por Heang Ya was President of the Khmer Community from 1994-98, a period of growth and consolidation. He arrived here with his wife and daughter in the early 1980s, was a District Officer for the New South Wales Department of Community Services, and completed a Master’s degree in Social Administration. During his leadership of the Community, the million-dollar Bonnyrigg Buddhist Temple was financed and built. He revisited his home village in Cambodia, whose temple had been destroyed, then restored. 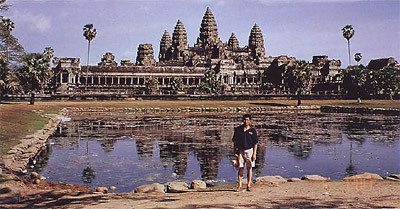 Por Heang Ya, President, Khmer Community 1994-98 at Angkor Wat.